It’s the seventh year of the Trojan War, and the scene is set. Onto the stage swerve warriors in Mad Max style goggles and leather, revving their motorbikes. Vast, rusting containers and a chandelier of jangling copper fragments imply that we are in a dystopian world of war. This is RSC Artistic Director Gregory Doran’s new production of Shakespeare’s Troilus and Cressida in collaboration with virtuoso percussionist Evelyn Glennie. From the very start, it’s a chaotic world resounding in battle. There are 2 plots to this play. Seven years into the war, it’s stalemate. Achilles is refusing to fight, but Ulysses is hatching a plan to bring him back to battle. He is going to use heroic Hector as bait. It’s also a love story, with the young Trojan prince Troilus trying to win over Cressida. No sooner has he gained her affections, than she is used as a bargaining tool in the war. This is a satirical tragedy in which valiant power posturing and love is lost to war. From the very start, Evelyn Glennie’s discordant score takes charge. Her soundscape is integral to the tale, with thumping percussion introducing characters, and vibrating through the audience. It’s immersive and the whole set becomes a part of the metallic sound-world, with musicians and instruments on stage and embedded in the set. Even the chandelier of rusting copper moves and makes unsettling sounds. If you haven’t heard of Evelyn Glennie before, let me introduce you to this virtuoso percussionist. Since the age of 12, she’s been profoundly deaf. She is also notably recognised as the first musician to maintain a full-time career as a solo percussionist, perfoming with orchestras all over the world. This is her first theatre score, and her soundscape doesn’t just enhance, but defines the production. 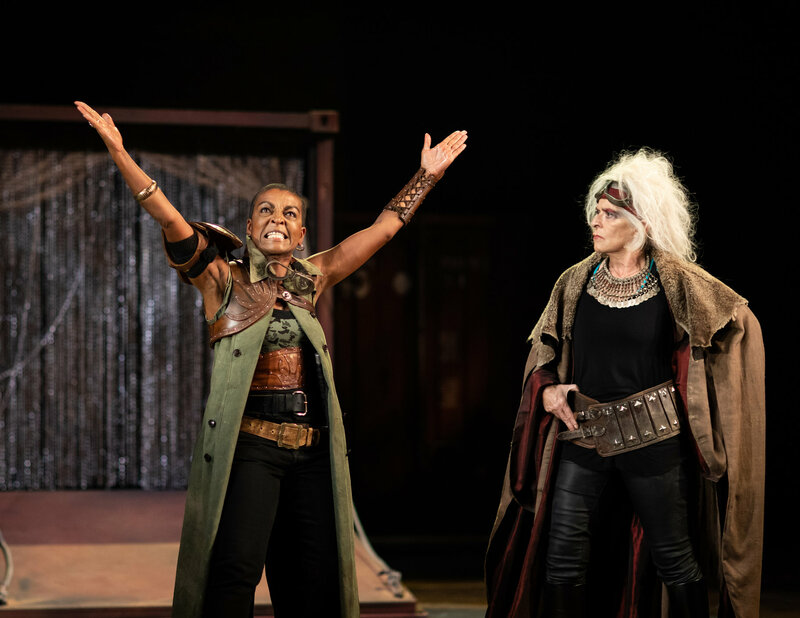 “It’s important for me that many of the sounds in Troilus and Cressida are felt throughout the whole body…This is a play based on sound scales more than melody. The ‘Mad Max’ approach to the sound design is ideal for the shapes, sounds and execution of percussion. With such a strongly visualised production, it was a joy to see the set elements echoing Shakespeare’s words and to then, in turn, reflect these in the music” – Dame Evelyn Glennie. In the world of Troilus and Cressida, men and women are expected to behave according to traditional gender roles of Elizabethan England. Men must excel at combat and politics. Women, on the other hand, are expected to be obedient, subservient and silent. Disrupting this gender hierarchy, Gregory Doran has cast brilliant actresses in many of the male roles to create a gender-equal production. Adjoa Andoh is imposing as the manipulative Ulysses and Suzanne Bertish plays a dominant Agamemnon. Scottish actor Sheila Reid (well-known as Madge in Benidorm) provides a biting satirical commentary as Thersites, often sitting atop the vast containers to survey the scenes below. Another highlight of the casting is Charlotte Arrowsmith as Cassandra. Her hysterical high-pitched screams define a distraught prophetess. It’s a powerful performance by the first deaf actor in an RSC play. Amber James creates a street-wise, straight-talking Cressida. But the problem is that Shakespeare has destined her to play the stereotypical promiscuous woman who becomes little more than a commodity to be bargained in war. By the end of the play, with a lack of soliloquies, we are left wondering where our strong millennial Cressida has gone. Troilus and Cressida is still a problem play, but this is a swaggering production which you won’t want to miss.